Unlock The Secrets of SpiraTeam v5.1! Spira v5.1 is now out! This blog gives you some insight into the release and discusses our accelerated release strategy going forward. So, you’ve seen the news article about Spira v5.1 being released, we hope you like the changes in the latest release and look forward to what we have planned in 2017. This blog gives you some insight into the release and discusses our accelerated release strategy going forward. We have always been a big proponent of agile development and continuous integration. However, we would traditionally deliver new releases of SpiraTest, SpiraPlan and SpiraTeam (aka Spira) every 4-6 months with minor updates in between to address bug-fixes and security updates. However, with the release of Spira v5.0 we re-architected the solution to be able to release (and deploy to our cloud infrastructure) new versions every 2-3 months. So, you can expect the 5.x releases of Spira to be made at an accelerated rate going forward. For download customers, the upgrade process will also be faster since it will not involve database changes and therefore can be done without a maintenance outage window. From the beginning - back in 2007 – SpiraTest was designed around the concept of ‘self-contained’ projects. Each project had its own artifacts and users were members of specific projects. Over the years we added project groups (which we will be renaming “programs” soon) to allow program managers to do reporting across multiple projects. Apart from that, the self-contained project paradigm has remained a constant. This is just the first step in our plans to add even more functionality to the project group planning board and to introduce program roadmapping features. We will have more information in this blog as we have mockups and designs to share. Hopefully not lost amongst all these new features for cross-project planning and traceability are some general improvements that our users have been asking for. 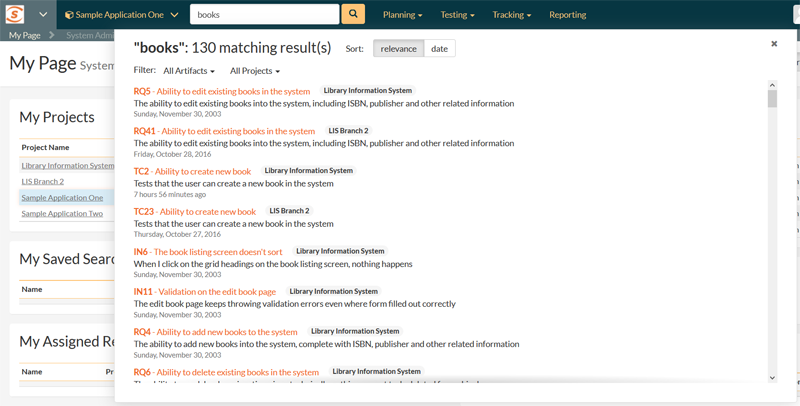 Based on feedback, we also made the search result dialog larger and have the ability to narrow down the results by project and artifact type. In a similar vein, we will be adding functionality in the next couple of releases to further speed up the display of pages in Spira and to make switching between different artifacts faster and easier. This feature has an interesting story. In 2015 during the Agile Alliance conference here in Washington, DC, we met with a testing and quality assurance expert at Lockheed Martin. During these conversations we realized that most test management tools on the market could not trace requirements to individual test steps (only to the test cases that contain the steps). SpiraTest was no exception and we didn’t think any more about it. Later that year, three of our other Defense customers also expressed the same need and we gleaned a gap in the market. In Spira v5.1 we added this feature realizing that it will not be used by 90% of our customers, but is critical for 10% of the market that desperately needs it and until now have had to use workarounds and customizations instead. 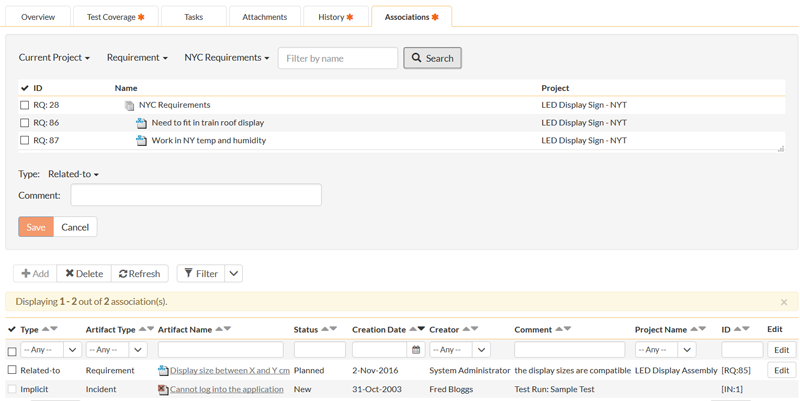 So with SpiraTest v5.1, you can now trace your requirements to individual test steps and meet your regulatory needs in various industries out of the box, with no customizations or changes. 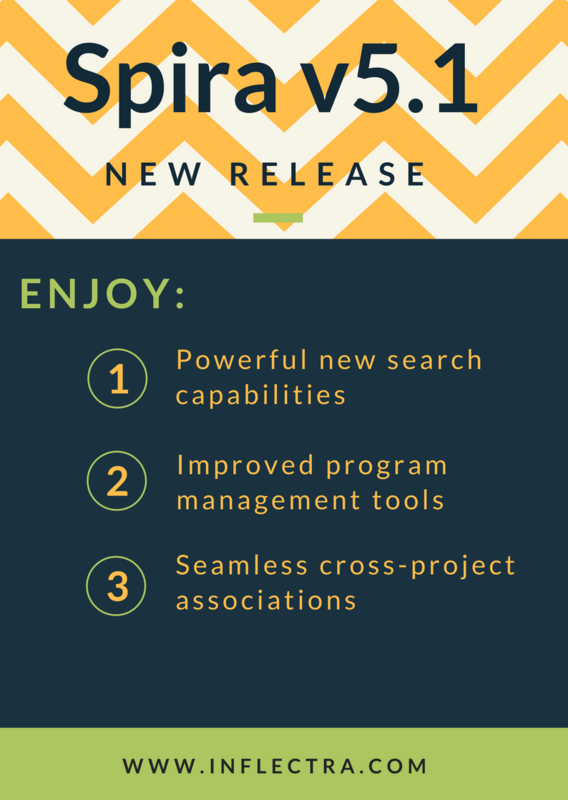 We hope you enjoy the changes in Spira v5.1! We plan on delivering Spira v5.2 in early 2017 and look forward to hearing from you with any feedback or suggestions!